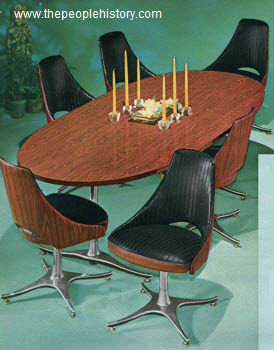 Description Table and six chairs.The 42x60 inch table opens to eighty-four inches with two twelve inch leaves. It has a durable high-pressure plastic top in a woodgrain pattern. 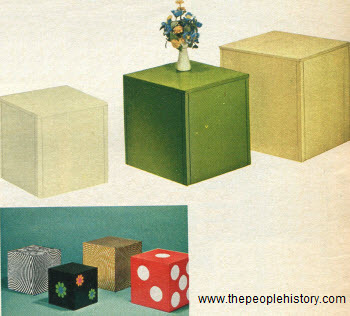 The chairs are box-welt seats that are cushioned and have vinyl plastic covers. Description Here are exciting new ways to add vibrant, wake-up life to your home that inspires any room scheme. Non-sag spring base supports resilient four inch thick cushions. 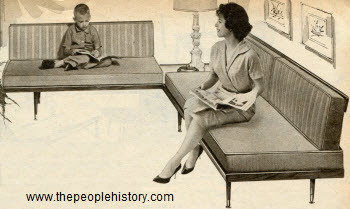 Sofas have walnut finish legs and are twenty-seven inches deep, twenty-seven inches high, and have twelve inch high bolsters. Set has two lounges, one with a table end and one without. Comes in cotton and rayon tweed stripe and solid cover. Choose from medium Ming blue with blue, Parchment beige with Parchment beige, orange with orange, medium green with green, or black with brown. Description Free-standing Lounge Outfit. Distinctive contemporary styling and it has a tweed effect in heavy duty, elastic-fabric baked vinyl. Hardwood frame construction. 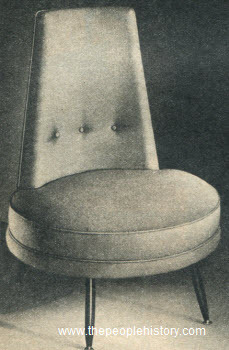 Two deeply cushioned, removable seats have no-sag steel springs and are twenty-two inches deep with a thirty-four inch high back. They are reversible for a right or left hand corner. Beautifully contoured table has a high-pressure plastic top, brass-colored plastic edging, tubular steel legs with baked-on black enamel finish, and brass tipped feet. Description Beds, springs and three cotton-filled mattresses. A novel idea that will help you save floor space. The youngsters will love them. You can arrange them to fit your needs... stacked as a three-tier bunk bed, as a bunk with trundle bed or separately as three twin-size beds where space is not a problem. Fully assembled solid hardwood. Removable four-rung ladder and guard rail. Description Mix or match black with brass and vinyl. Buy in combination or individually. Has all-steel construction and no tools are needed. Rubber pole tips hold tightly in place and won't mar ceilings. Fits ceilings that are 7 ft. 9 in. to 8 ft. 11 in. Shelves slip easily in slots six inches apart. Shelf support bars included. 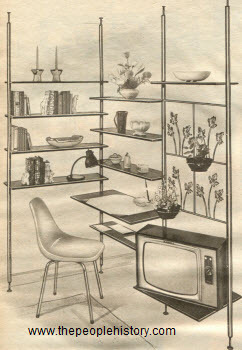 Shelves are black-enamel finish or vinyl-clad with grained walnut finish. 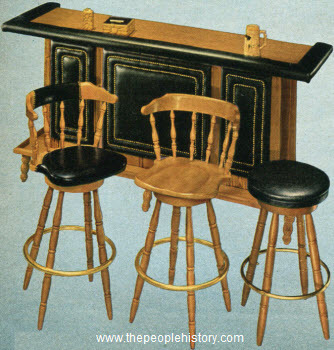 Poles are black enamel or brass-plate. . Description Rich, elegant good looks with graceful styling uncluttered by hardware and with maximum storage space. The tops and fronts are 5 ply veneers on hardwood, the ends are 3 ply. Solid oak sides, backs and drawer interiors. Solid ash framing on mirror and exposed parts. Cases are fully dustproofed. 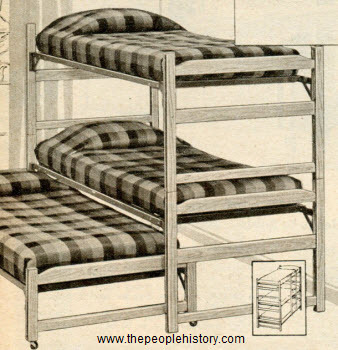 Beds have metal side rails and no-slat adjustable bed hooks... no need for troublesome cross slats. 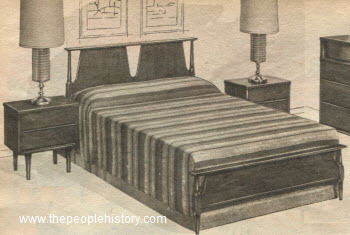 Three piece suit includes bed, five-drawer chest, and triple dresser. Description Finest quality and style combined in this beautiful china cabinet. Hutch securely locked to base has two sliding plate-glass doors. Inside there are two big shelf spaces. Condiment shelf below. Finished in metallic-beige baked on enamel. 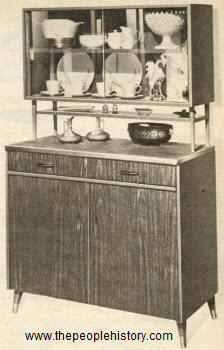 Base has wood-grain plastic front and top with brass-plated trim and hardware. Sides are metallic-beige enamel. Two double-constructed drawers are insulated. Two hinged doors are also double constructed. Two shelves. Magnetic catches and die-cast pulls. Colors are natural walnut or bleached walnut wood-grain plastic. Description Newly slim, high fashion lines delight the eye, and you still enjoy deep, deep recliner comfort. Sculptured, trim.. exquisite good taste for any home. Deep comfort in a recliner that doesn't look like a recliner at all... hidden footrest makes it even more slim. Rich and elegant wood trim... rubbed to a mellow walnut finish. 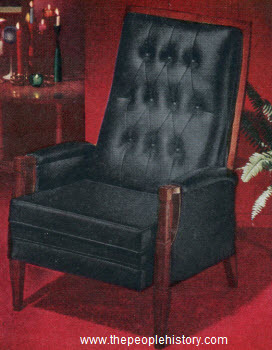 Fine-furniture detailing in tufted back. 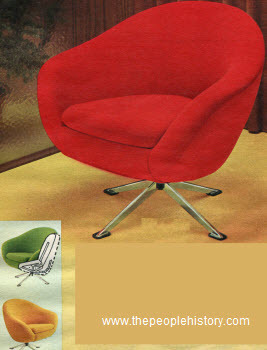 Upholstered with expanded plastic... fabric supported for longer wear... glove leather soft. Has a reversible cushion, rubber strap base, insulated non-sag springs in back, padded arms, cotton felt, and kiln-dried hardwood frame. Description He'll be delighted with the completeness of this dressing center... designed to pamper him. The cushiony thick seat is made with three-quarter inch Tufflex cellulose fiber and half-inch foam rubber covered with tough vinyl that wipes clean, resists scuffs and scratches. Matching padded backrest. Sculptured full-shouldered hanger to hold coat in shape. Trousers slip into trouser bar. Tie and belt holders. Shoe rack. Pocket item tray. Brass plated frame. Wood hanger and tray. Description These rugs are absolutely irresistible. Marvelously frothy, fluffy and so soft they're beyond comparison. Just the thing to add an aura of elegance to your bath; or try putting one next to your bed and see what a treat it is to step on first thing in the morning. 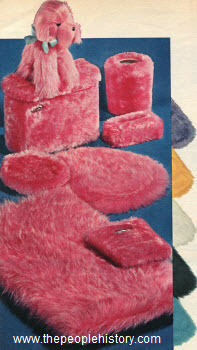 But these rugs were made to last as well as to enjoy. The Verel modacrylic pile is really durable. Washes and dries quickly and stays fluffy every time. Polypropylene olefin skid-resistant latex coated back. Colors are dark pink, black, medium violet, turquoise, white or medium yellow. Description Transform a dull corner with sprightly color. 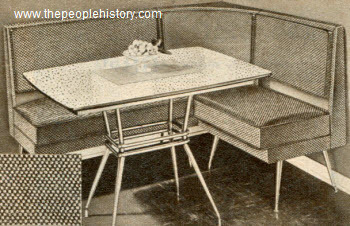 Chair has rayon and acetate tweed cover, padded overall with Serofoam and cotton, sagless spring base, molded plywood frame, walnut finished hardwood legs, and brass-plated self-leveling glides. Measures 31x24x40 inches high overall and the seat is 31x22 inches deep. Colors are tangerine, medium fern green, federal gold, and parchment beige. Description A cellarette that's a fine piece of furniture. Has a rich walnut finish with plastic top. Lift top, drop front edge for serving area finished in stain-resistant plastic. Set of eighteen assorted glasses in tray holders. Two piano-hinged doors open to storage shelf. Bronze-color hardware. Hardwood front, sides and frame; hardboard back. Measures 36x15x26 inches high overall. Description Polished cast aluminum bases in free-flow design. Chrome-plated tubular steel columns. Rosewood grained plastic table top is forty-two by sixty-six inches and expands to eighty-four inches with an eighteen inch leaf. 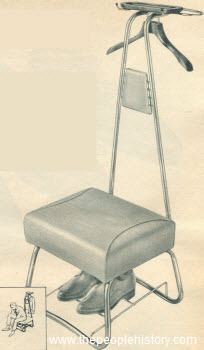 Full back chairs with cotton and polyurethane padded seats. 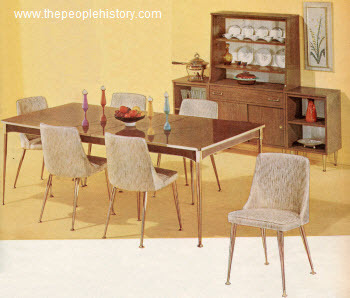 Table and six chairs. 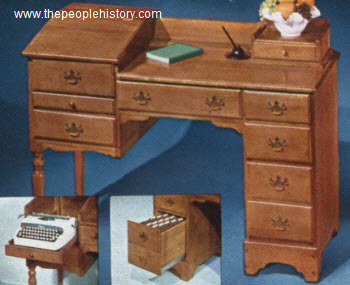 Description Typewriter desk has a sliding shelf that holds your portable typewriter. Four drawers plus a file drawer. 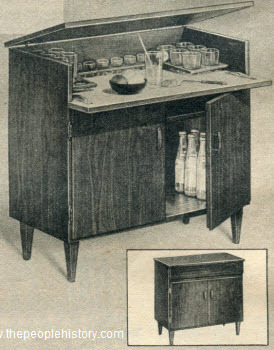 Has an oak interior with a plywood back. Measures 48x21.5x35.75 inches high. 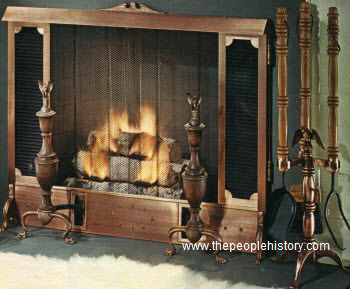 Description Early American style standing screen. Black shutter effect provides contrast to antique copper finish steel frame. Black pull chain operated half-drape curtains (three pleats in each section). Shutters finished in baked-on enamel, frame is protected by baked-on clear enamel. Measures thirty-eight inches wide and thirty-one inches high. 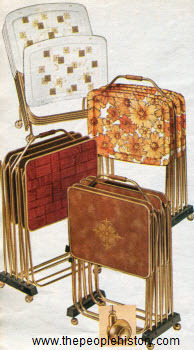 Description Five piece hostess tray sets roll easily on casters... right to the party spot. Sets vary in style and price. Seville set is fiber glass on brass finished legs, sunburst set is space-saving with brilliant colors, parquet trays have Imperial shape hardboard and anodized aluminum band trim, the Imperial set has aluminum banded trays with vinyl-covered leatherette finish. Description Sit and sip a lemonade... bring guests to yard or patio and seat them in furniture gayly cushioned with big bright orange and yellow flowers on supported vinyl. Solid yellow cotton duck is on the reverse side. Button-tufted cushions comfortably padded with shredded Serofoam polyurethane... back cushions slip on, stay in one place. Sturdy one-inch polished tubular aluminum frames. Double tubular arms. Plastic tipped leg glides help keep pieces steady on lawn or patio. 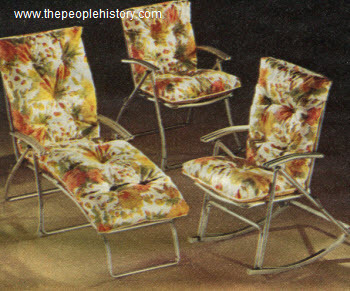 Set includes chaise and two chairs. Description Touch it... quivering soft. Lift it... surprisingly lightweight. Sit in it... feel it relax tension out of every pore. Just be sure you put this great looking chair where you don't mind second glances. Serofoam polyurethane are two and a half inch loose seat cushion, back and arms. If someone spills, don't panic, most things wipe right off this closely woven covering. So swivel away... nylon bushings never need oiling. Colors are red, olive or gold. Description Bolster covers of rayon, nylon; plaid tweed seat covers of rayon, cotton, other fibers. Serofoam polyurethane seats, decks of rubber strap webbing. 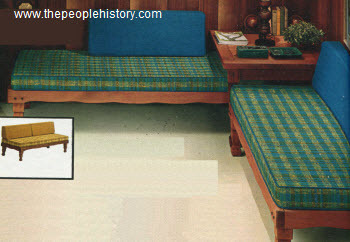 Corner lounges have two zippered bolsters, one fifty-four inches long and one thirty-six inches long. Each lounge makes a bed. Fruitwood finished redwood, with Scotchgard Brand fabric protector and reversible four inch thick seat cushions. The redwood corner table has a parquet top. Description Made with maple finish hardwood and the melamine plastic top has a maple woodgrain... resists scratches, stains and burns. The black vinyl spill rails and decorative panels are padded with polyurethane. Footrail extends to back of bar to form a shelf. Description Finished ($36.95) or unfinished ($29.95), Kubes present an exciting, but economical way to decorate with a flair. Choose avocado, off-white, or natural... or let your imagination run wild using paint, appliques, or paper. Kubes are of solid hardwood with completely locked joints. Single Kubes are sixteen inch squares, nested Kubes are in groups of 16, 14, and 12 inch squares. Choose from ready to finish, avocado, or off-white. Description Color-coordinated, vinyl-coated wallpaper. Price is $6.95 for a fourteen-yard bolt. Here's a delightful way to make a room as bright, colorful and "mod" as today and as fresh as tomorrow. Bold's the word in tough vinyl-coated wallpaper that's prepasted--no mess, just cut it to fit, dip in water and quickly smooth onto the wall. Washable-- they'll keep their color, even when washed time and time again. Strippable-- no steaming, soaking or scraping... when you want a change just loosen a corner and it comes off easily in strips. Pop art vinyl coated wallpaper is black and white, a razzle-dazzle eyestopper. 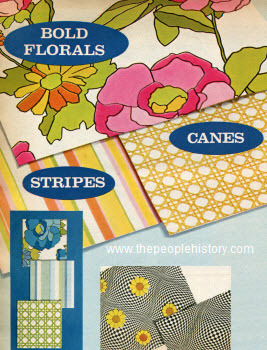 Comes with daisies or without daisies, other colors are pink and federal gold or blue and green floral pattern, pink and tangerine or blue and green on white stripes, or federal gold on white or green on white cane pattern.